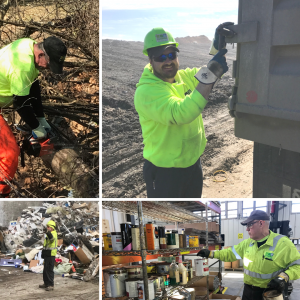 During the month of March, our safety team reminded employees about the importance of Personal Protective Equipment (PPE). All LCSWMA employees and visitors are required to “Suit Up for Safety” while navigating our sites. PPE includes ear plugs, safety glasses, steel-toed shoes, hard hats and work vests. Thank you LCSWMA staff, customers and visitors for your commitment to a safe workplace!